Remember Goldeneye 007? The 1997 game based on the James Bond movie? If you don’t, I won’t blame you, but here’s some background to jog your memory: Goldeneye 007 was first released for the Nintendo 64 in August 1997. The game featured a single player campaign where players took on the role of James Bond. Both Nintendo and the gaming community have come quite far from then as witnessed from the consoles Nintendo makes now, and the kind of games we’re seeing all over the place. 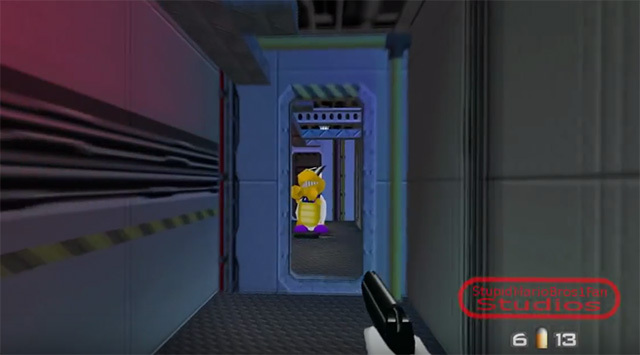 However, nostalgia wins over all the time (I mean, there’s an impossible remake of Tetris for god’s sake) and a new Mod developed for Goldeneye 007 replaces the Goldeneye 007 characters with those of Mario. So you get to complete James Bond’s missions looking like Mario. The Mod also adds almost every other character from the world of Mario including, Luigi, and Peach. The Mod is very cleverly made; it doesn’t just swap character models from Goldeneye 007 with those from Mario but also changes the dialogues and the pre-level briefings to reflect the changes in the characters. So you’ll not be addressed as Mr. Bond when you’re actually looking like Mario. However, before you get too excited to play this modded variant of Goldeneye 007, you should know that the developer has mentioned that the mod only works on ‘real hardware’. So you’ll need an actual Nintendo 64 lying around because the mod will not work on an emulator. This very restriction is why I couldn’t play the game for myself and offer my personal opinion about it. However, from the idea at least the game certainly looks like it’ll be a lot of fun to play. I can almost imagine Mario doing all the crazy things that Britain’s most dangerous spy gets up to. If you do have a Nintendo 64 lying around first of all, lucky you. Second, you can download the mod from Mod DB and let me know how you liked it in the comments section below. The mod has been developed by Daniel Hindes, who has also uploaded a video to show off all the characters used in the Goldeneye 007 x Super Mario Mod.